My uncle Yossi was a story teller, passionate about the sea and a colorful character. He loved making things from wood, a hobby which cost him half his thumb, in a collision with an electric circular saw. Of course he told us kids that the missing half thumb happened as he engaged in a battle with a monstrous, giant octopus, which of course Yossi won, thumbs down. Forgive the pun…Dead octopus, versus half a thumb, was a small price to pay. I was so proud of my uncle, the hero. Even after I found out the truth, he stayed a hero, protecting his divers with a diving dagger in one hand, in the other his water gun poised at a hungry shark. As head of Aqua Sport in Eilat he was often called “The Israeli Jacques Cousteau”, taking scuba divers to the most breathtaking spots in the Red Sea, at one time considered one of the the most pristine coral reef anywhere, filled with brilliantly colored fish, red coral and on deeper dives, sharks and bottom feeders. The divers who frequented the club were Europeans, who adored the climate, abundant sea life and my uncle. For my twelfth birthday my gift from him was a deep sea diving certification and I became a girl obsessed. 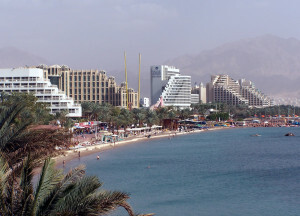 I thought there was no place as beautiful and up until I became older, Eilat and the red Sea was IT. First opportunity I had, there I was, on a diving expedition, excited like a jumping bean, on the boat to the reefs. The view was amazing, and our dive master told us Cozumel is the largest island of the Mexican Caribbean, and one of the premier diving (and non diving) playgrounds in the world, with it’s sub tropical climate. Well, the dive was a dream…better than I could imagine. I got to play with Hawksbill turtles, held a seahorse in my hands, saw whale sharks and nurse sharks, ferocious looking Moray eel, flora and fauna with brightly colored crustaceans. We even spotted an endangered species of fish, the shy toadfish, indigenous uniquely to Cozumel. I descended happily drinking in the beauty of the variety of brilliantly colored fish and swimming with a group of sharks, feeling safe and protected under the watchful eyes of the dive masters who barely left my side. There are two main coral reef systems surrounding Cozumel, Colombia and Palankar, both stunning yet differently exhilarating. My family visited the Chankanaab Lagoon, one of the most visited sites in the world, where both snorkelers and divers can observe limestones and coral formation which look like sculptures made by a great artist. Which in fact they were, by the greatest artist of all, Nature. My first visit in Cozumel was pure magic and undoubtedly, the greatest dive of my life. The kids in the family said the snorkeling was equally incredible and it was a Herculean feat to get them out of the water. For those who don’t wish to get wet, there is so much to see, so much history. It’s as if the Conquistadors are watching the island proudly – maybe it’s just me, but there’s is an energetic presence which can be felt. The Mayans called the island the Swallows and built a town along the crystal clear waters and it was Jacques Costeau who discovered Cozamel as a premier diving spot. Visitors discovered it as a peaceful, gorgeous vacation spot to walk the Mayan remains and the sea side. Or just relax and soak in the beauty and peace. This entry was posted in Travel Experiences on November 24, 2014 by slAdmin. The Eden Roc Hotel reigns as an architectural masterpiece and personifies a shining moment in Miami Beach history. It has a tremendously full and brilliantly fascinating history, which is the reason I chose to write about it. Being a history buff, I am enamored of the wondrous beauty of most legendary landmarks. When we’re talking passover hotels, establishment with a long and full past, carry an added element which appeals to the romantic in me. Spending a night in there, feels like an infusion if will, with the past, the personalities that frequented it. A highly elevating experience, that. It goes far beyond the comfortable luxury of any new hotel, however grandly and tastefully furnished…this is Magic, with a capital M.
Miami Beach’s Eden Roc may not be as old as some of my favorite old hotels around the globe, but in the 60 years it has been around, it has packed enough history, victories and controversies, to be the subject of books and films. Two partners, Harry Mufson and Ted Novack built the San Souci hotel together and then proceeded to begin on the most ambitious project of their career. They bought a large piece of land and began the process of building the most exciting hotel ever built in “The Magic City”, a.k.a. The Fontainebleau. The architect they hired initially was fired for lacking ‘the some special’ they were looking for, which is when they turned to an unlikely architect, Morris Lapidus. Lapidus was a relative newcomer to hotel design. He was the architect behind some landmark department stores such as Macy’s and Saks Fifth Ave, both of whose which are brilliantly impressive to this day. For over 27 year Lapidus specialized in merchandising and has never worked on a hotel before he first met with Novack and Mufson. Nevertheless, he was certain of his ability to produce the most extraordinary design, something unique, and very captivating. They were caught up in the innovative passion coming from Lapidus, and went on to hire him after their first meeting. While Fontainebleau was being built, Harry Mufson bought up the Warner Estate, which belonged to one of the Warner brothers, and realizing the deepening estrangement between himself and Ted Novack, asked Lapidus to build him a hotel far superior to the Fontainebleau. “None of that French stuff, that’s for kids” he said. I want splendor and luxury and Lapidus is quoted as saying _”I wanted them to fall on their faces when they saw it”! He proceeded to travel to the exquisite Antibe’s Eden Roc in France for research. 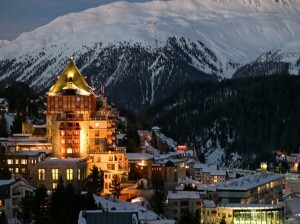 The hotel which was a favorite vacation spot for the Kennedy’s and other international luminaries. He didn’t wish to copy it, just drink in the impressions, bought Venetian Glass, statues and marble with the picture of the grand new hotel fully formed in his mind. The opening of the hotel was a huge success. It was 1956 and word spread and the place became a magnet for the greatest celebrities of the era. Anyone, from Liz Taylor, Sammie Davis Jr. Jerry Lewis, Mike Todd, Lucille Ball, Dezi Arnez, Ann Margret, Lena Horne, Katharine Hepburn, Tracy, Groucho Marx, Humphrey Bogart and Lauren Bacall, and the list is endless. Celebrations for movie openings such as mega star Liz Taylor and husband Mike Todd’s “Around the world in 80 days, were held at the Mona Lisa room, just off the grand lobby. At Harry American Bar, which became the hottest night club in town you’d see familiar faces from wall to wall. Liberace, Joe D’maggio, the Bogarts, Jackie Gleason, Esther Williams were just some of the people who frequented the club and danced the night away. There’s murals by artist Al Hirshfeld, featuring all these celebs, and it can be still seen today. Even the entertainers were world class – the likes of Harry Belafonte, Jimmy Durante, Milton Berle and Nat King Cole. How I wish I was there…oh well I’m here now and I can go there and soak up the atmosphere where these giants were having their own belle epoch. In 1962, past partner, present enemy Novick, who now owned the Fontainbleau decided to build a 17 story tower, facing the adjoin Eden Roc. Just a brick wall with only one window, his own suite’s, called then and now ‘the spite wall’ to express his envy and displeasure at the superior success of his former partner’s success. Unfortunately, the tower threw shade onto the swimming pool each afternoon and blocked the views partially. Until 2008, pre 300 million dollar renovation, the wall was some visitors were forced to look at from their balcony. 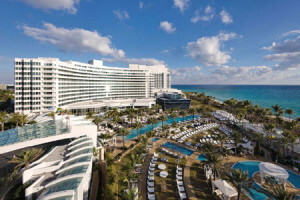 Now the hotel has expanded much higher sporting over 650 rooms, several pools beside the ocean where nothing can block the sun and an ingenious placement of glass panel instead of the sold balcony walls, so patrons can look out at the Atlantic or/and Biscayne Bay. The society for historic preservation is keeping an eagle eye on the change because anything designed by Morris Lapidus holds a place of great importance to retain the authentic, organic feel of Miami Beach. They believe it’s a symbol of the finest hours of the city—and it should be preserved to the greatest extent possible. The guestrooms and ballrooms, spa though new, they made sure to follow the spirit of the Magician who created the legendary hotel in the first place. This entry was posted in Travel Experiences and tagged miami, travel on November 5, 2014 by slAdmin. After my blog about the Atlantis hotel posted, I realized that true to my egg head nature (I wanted to be an archeologist when I was a kid), I spent so much time on the history of the place, I failed to elaborate about the immensely fun things the place has to offer. So we’ll start with the kids- the 11 pools and 20 swimming areas are a built in entertainment, with most barely ever changing out of their bathing suit, turning coconut brown despite the waterproof sunscreen and a little hoarse from squealing with excitement. You’ll have to bribe them to come up for food but the smile on their (and your) face will make it worthwhile. The younger kids will enjoy the tube slides and water cannons at the Splashers (named ‘just for them’ and bound to make them feel like tiny VIPs. The Ripples have mini slides,which are safe and great fun for the young energizer bunnies. Then there is the Mayan Temple pool for the whole family, with it’s stunning waterfalls, and The Baths, with their large deck. You can soak up the sun and erelax or plunge down the Slides. Or do both. 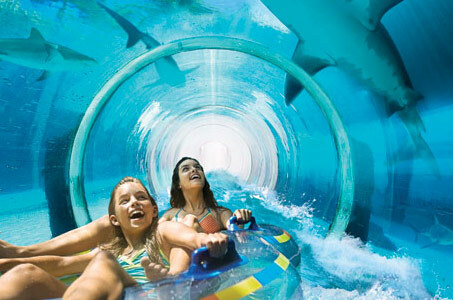 There are some more intense experiences for the Tweens and teens amongst us: The Leap of Faith, which is a 60 foot, almost vertical drop and and makes one feel like a Super Hero and the Serpent slide,a twisting ride, with moments of total darkness and descent into the shark lagoon, through a clear tunnel. Kids 3-12 can partake in a variety of activities designed to bring out the artist in them, discovering talents they didn’t know they had: cooking classes, directing and acting in their own movies and experimenting in visual art, creating virtual postcards they can say later: this was my first attempt at art and it gave me my true passion. Atlantis show stoppers are the habitats of the marine life and the resort has the largest open air aquarium in the world. There is also the 141 acre water park (both free), and has the most diverse and brilliantly colored sea life. Over 250 species and 50,000 critters live in the 14 lagoons, filled with 8 million gallons of fresh salt water. Spiny lobsters, sea horses so cute you’d want to adopt them. Indoor at The Dig, six foot long Moray eels, iridescent jelly fish ,spotted eagle rays surrounded by schools of fantastically colored tropical fish live in the Ruins Lagoon. For certified scuba divers the Lagoon will provide a swim alongside Hammerhead, Blacknose and Reeftip sharks. Even if you just walk thru the acrylic tunnel of the Predator Lagoon, you will experience these most dreaded of creatures zigging by you. By now we’re at the subject of my previous article- swimming with the dolphins, patting stingrays, becoming trainer for a day and really interacting with sea lions and dolphins. For those interested in gambling, there is a world class casino, and for adults and adolescents plenty of dance and partying. My preference would be a romantic walk on the beach, your skin caressed by the evening breeze from the ocean, stars and the moon lighting your way on the heavenly soft white sand. Be sure to walk barefoot to let the sand caress your feet. It’s an experience you’ll have embedded in memory for many years to come. Check out the 2014 Sukkot Kosher Cruise where you could be staying at the Atlantis Resort at Paradise Island for over a week! Love is the most powerful way to create profoundly tangible transformation in everyone who crosses our path. Yet we must be mindful to endow the self with pure, unconditional love and acceptance, which will result in an infinite fountain of empathy and joy, readily available to give others. This entry was posted in Cruise Tips, Travel Experiences on July 1, 2014 by slAdmin. Since I was a little kid, I always wanted to swim with dolphins. One of my favorite mammals, and hands down winner of all aquatic mammals, in my opinion. All my other favorites, puppies horses and elephants, are all beloved land dwellers. But after a visit to Sea World, I became hooked on the intelligent, smiley creatures, with their sonar communications and gentle faces, so responsive to training they certainly understood a large vocabulary. I felt a desire to interact and play with them and their pals, the sea, frolicking by their side, patting their smooth fur. 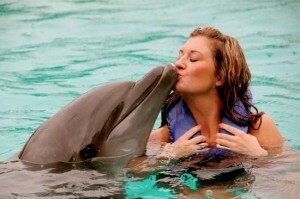 My first chance to swim with the ocean’s most remarkable inhabitants, the playful and adorable dolphins, occurred when I visited Dolphin Cay at the Atlantis resort during a Kosher Cruise to the Caribbean . In this amazing 14 acres resort, filled with 7 million gallons of sparkling, crystalline seawater, I got to visit one of the largest and most advanced animal rescue and rehab facilities in the world. My immediate impulse was to go deep sea diving and join the dolphins as their agile bodies swam around, all the while feeling safe. I had an encounter with a dolphin who picked me and not only stuck around but actually gave little gentle nudges to my face, and continued with me as I surfaced and removed my mask. The shallow water swim is ideal for kids and the less adventurous. Almost everyone of any age or strength level can experience the waist deep shallow water interaction with these most delightful creatures. The bottle nosed dolphins, with their upturned lip-corners, have the sweetest expression, it kind of reminds me of my constantly smiling little dog, Matilda. My new buddy, the dolphin I named Samantha, kept swimming around me and I got to hug her and feel her slippery body with my hands. She was tactile and made sounds, as if she was trying to talk with me. Samantha followed me around until I left the water and I planted a kiss on her cute face. Some sea lions also became very friendly, playing with me and one another and I was more enthralled than ever. I saw a group of people engaging in what is called the ultimate trainer day program where they get an in depth, up close and personal look and encounter with dolphins, sea lions, and even sharks. Some people went snorkeling alongside exotic tropical fish, eels and sharks of such exquisite colors, while looking at the ruins of the city of Atlantis. I found out that the first residents of dolphin cay were 16 dolphins rescued from marine life Ocearanium, Mississippi, during hurricane Katrina. Also, that if you always wondered how the trainers get these animals to do their amazingly amusing feats, how they feed and care for them, the Dolphin Cay offers an exclusive Trainer for a Day program. With it’s over 50,000 marine animals representing over 250 species, this is the perfect place to snorkel with them and discover secrets of the underwater world. This entry was posted in Cruise Tips, Travel Experiences and tagged Bahamas, Dolphins on June 11, 2014 by slAdmin. The Caribbean Islands consist of thousands of islands, all of which border or are enveloped by the Caribbean Sea, yet they are divided as Island countries, some as a sprinkling of land belonging to a larger country, some remnants of past Grand Empires, British, French, Dutch and more, some small, often stunning pieces of paradise, surrounded by lapping, turquoise water, lush vegetation and mere extensions of their nearby mainland. Paradise Island is aptly named. It is a beauty to behold, located just off the shore of Nassau, Bahamas and is connected to the northern edge of the island of New Providence, by two bridges that cross Nassau. Before World War II the island was known as Hog Island, and was the private estate of the Swedish billionaire, Axel Wenner-Gren. It had a small airstrip, with a seaplane base equipped with a ramp for aircraft. In 1989 a 3,00 foot runway was added to the airport, which closed 10 years later without leaving a trace. The heir of A&P supermarkets bought Hog Island from Axel Wenner-Gren, promptly changing it’s name to Paradise island, and began installing landmarks designed by Palm Beach architect John Volk. First the Ocean Club Hurricane hole the Golf Course and the Cloisters, a 14th century monastery which was originally bought and dismantled by William Randolph Hearst in the 1920s. He hired the greatest celebrities, such as Gary Player to be his golf pro and Pancho Gonzales, the tennis pro. When Paradise Island opened to the public in 1962, it was an event so big that Newsweek and the Times covered it with great hoopla. The staff was hired from the best hotels, such as Eden Rock to work at the Ocean Club. The fireworks for the opening party were flown in from the South of France. The island got its own flag and Paradise Beach was featured on the 3 dollar notes in 1966, which was equal to the Bahamian Pound, ($3=£21). The island began to develop as a major resort, sold to Merv Griffin in the 80s for $400 million, and finally to it’s current owner, Sol Kerzner. It’s estimated value is around 2 billion currently. The Atlantis Hotel and Resort was built as a resort and water park, opening first in 1998, when South African hotel magnate Kerzner dreamt up the height of luxury in a beach resort. The Royal Towers were built, followed by the refurbished Coral and Beach towers, all part of the magnificent, extravagantly beautiful Royal Towers. The theme of the hotel is the mystical Atlantis, with Mayan influenced attractions, such as the four major slides, Leap of Faith, the Challenger, the Jungle slide and The Serpent Slide. When the Cove Atlantis, a 600 suite luxury hotel opened in 2007 and another tower opened the same year, the 497 room Reef Atlantis. The Royal Towers contain the very famous “Bridge Suite” ranked by Forbes as one of the most expensive hotel rooms in the world, at 25,000 per night. 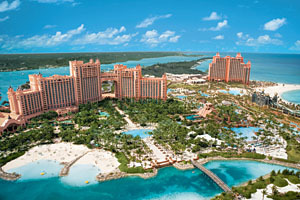 All of Atlantis hotel and resort are considered one of the most exclusive, luxurious and expensive hotels in the world. The other extensions of the resort, though just as lovely, are far more affordable to mere mortals and families with children plus couples wanting to luxuriate in the magnificent resort, flock here, partaking of the world’s largest open air marine habitat, The Dig, which provides guests with the thrill of tasting the life in the legendary sunken city of Atlantis, with aquariums scattered about the bottom with wreckage and debris of an ancient metropolis, surrounded by hundreds of species of aquatic life form. This entry was posted in Cruise Tips, Travel Experiences and tagged Nassau, Suite Life Kosher on June 10, 2014 by slAdmin. This morning I awoke to the sounds of hammering and electric drill emanating from the high-rise building that’s in the process of being erected next door to my bedroom, in mid-town Manhattan. Despite sleeping with earplugs, the noises are so intense that somehow they creep into my pre-waking dreams, or worse, just wake me up. Today my brain managed to create an absolute thing of beauty from the agitating noise… In my dream there I was, on the ‘Epic of the Seas’, the largest boat in the world, curled up like a fetus in my luxurious down duvet. 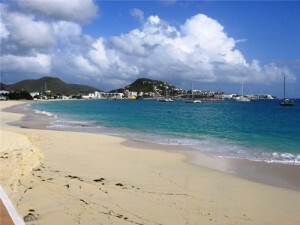 At the edge of consciousness I heard the fog-horns as the ship was about to dock at St. Maarten’s Dutch side harbor. I leaped out of bed, on to the balcony of my stateroom, and saw the island spread out in all its glory right in front of me. That’s when I awoke, still fetal, rubbing the sleep off my eyes, and realized I was very far from the Virgin Islands. I said a quick prayer, to get back there ASAP. The dream reminded me that the Kosher cruise to the Eastern Caribbean’s, one of my most recent ones, didn’t even make it to my blogs. I thought it was perhaps a subconscious reminder to write about this Kosher Cruise, which was indeed a source of wonder, awe and pleasure. We boarded in Fort Lauderdale, FL, and as soon as check in and border patrol were over, the people in our group were directed to the Aria dinning room, where the most beautifully appetizing buffet awaited us, with prearranged tickets to the Broadway show, Chicago. The first and second day at sea were filled with activities, with stops at Nassau and St. Thomas (shoppers were elated and bought tax free luxury items, like jewelry, perfume and returned to the ship, proud as peacocks, laden with packages and savings). At night we saw a masterpiece of aquatic production, the like of which I’ve never witnessed, by acrobats and divers, a mystically lit and choreographed show, filled with superstar athletes diving off 30 meter high boards into a tiny, oscillating pool, with the water moving to the rhythm of the high ocean waves. Then came Wednesday in St. Maarten and I got off the boat, deciding to do a solo excursion, my new Nikon SLR readily available in hand, ready to explore the island and it’s inhabitants. I began walking towards the center of town, meeting lots of smiling locals, each of whom had some ‘must see’ tip for me. As you know y now, I’m a pre-visit research aficionado, so I knew that the Island, as small as it is, had two sides, actually two nations. There was St Maarten, owned by the Dutch, and St. Martin, the French side (uses Euros as opposed to the more Anglicized St. Maarten, where US dollars are the going currency.) The walk itself was lovely, with glimpses to left of white washed beaches, turquoise waters, palm trees, peppered with people selling cold slices of watermelon and peeled sugar cane. On the right there were green hills, and up high, buildings of great beauty, mostly privately owned. When I got to town center I sat down for a breather and some cool water, from my backpack. The central plaza of Phillipsburg was packed with tourists and locals. Little kids timidly came by and asked to play with my hair, after politely asking their parent’s permission. I got a braid by a tiny little hair-maven, whose parents told me she wants to be a hairdresser when she grows up. In fact, hair, wigs, beauty shops are all big business on the island, since the local women seem obsessed with wigs, extensions and weaves and perms. The stores on the main streets are mainly Duty Free electronics, famous brands of jewelry at discount prices and some designer labels, which sell rather cheaply considering Europeans are used to higher prices, and no taxes on top it. I decided to explore the back roads, and saw wonderful little markets selling incense, hats, fabrics, and island garments, mostly white to repel the heat. The prices in the back streets were much lower and you could get a real deal if you were willing to bargain. In fact, the same is true in many of the fancy shops of the main street, but somehow the shops selling to locals seemed far more interesting, I got to talk to several people with interesting philosophies and realized once again, that people are Divine Creations, with great similarities, no matter where you go. There was enough time to take a glass-bottomed boat and look at sea creatures, coral reefs, and shipwrecks without changing into a bathing suit. We passed by the famous Simpson Bay, which moored over 300 immensely large and stunning yachts owned by the worlds super rich. I learned that St Maarten’s luxurious marina is the preferred destination of these mariners, during the months of November-May. We were scheduled to leave at 5:00 but I wanted one more adventure; I went to the tourist information booth and was told that a trip to Loterie Farm, a private nature reserve is about to leave in 5 minutes and will be back before 4:30. No hesitation, I booked myself on the tour and within minutes was seated in the air-conditioned minibus heading to the green ‘heart of the island’ with its hikes on rope bridges and raw nature. My shoes were perfect for this: I wore my Sketcher athletic shoes with a long white dress, to be covered from getting a sunburn or blisters. It was fun with a capital F. Only one person from the bus shied away from the adventure of walking across the suspension rope bridge. All of us though felt wonderfully brave and I had pink cheeks (so proud!) which a Swedish Tourist captured in a photo I’ve attached, as we were about to leave the island. This entry was posted in Cruise Tips, Travel Experiences on June 4, 2014 by slAdmin. On the way to and from the Alaskan Cruises, the largest and most famous city in Washington is the port that serves the ships, bound to sail to the 49th state of the USA. Having had the pleasure of staying there many a time, it is in my opinion a place worth visiting. Aside from having close friends who live there, thus having a place to stay if I wish, there is such joy I derive from this North Western city, that even if arriving for a cruise, which usually takes off on Sundays, I like to get there a couple of days early, book a hotel room well ahead of time and hike, take yoga classes, and elevate my spirits in this town, which has never let me down, with it’s clean air, temperatures which are never too cold or too hot, and a general air of healthy living. The birthplace of Starbucks and headquarters of Costco (whose own brand, Kirkland is named after the town it originated from), is filled with lush greenery, a history that contains famous characters and events and has an endless amount of activity one could fill their day with, feeling healthier and smarter than before they arrived. Seattleites are known as a brainy lot, having produced many brilliant and eccentric people, some of whom I’ll be sure to mention. Since the city is where the Klondike Stampede in the mid 1890 began, bringing men and women from across the world here, the Northernmost point of continental USA, on their way to depart for Dawson, heart of the Gold Rush. New hotels were built to cater to the influx, as the Gold Fever gave local merchants tens of thousands of customers. Stores like Cooper and Levy stocked trousers, bicycles, dog sleds and even sled dogs. The quantity of provisions was so vast it had to be stored in the street near the stores, because according to Canadian law each prospector had to have year’s supply of everything they might need. Of course, the city had to cater to the multitudes of people who came thru it, with many returning after the Rush petered out and settled there. People like Elmer Fisher, the elusive yet brilliant architect established the face of early downtown Seattle, his elegant stone and brick creations still decorating the city’s skyline, from Jackson Street to Belltown. Then there was Reginald H. Thompson, The King of the Hills, who had an obsession with leveling the city’s hills, giving it a facelift it had never seen before or will probably will not see again. 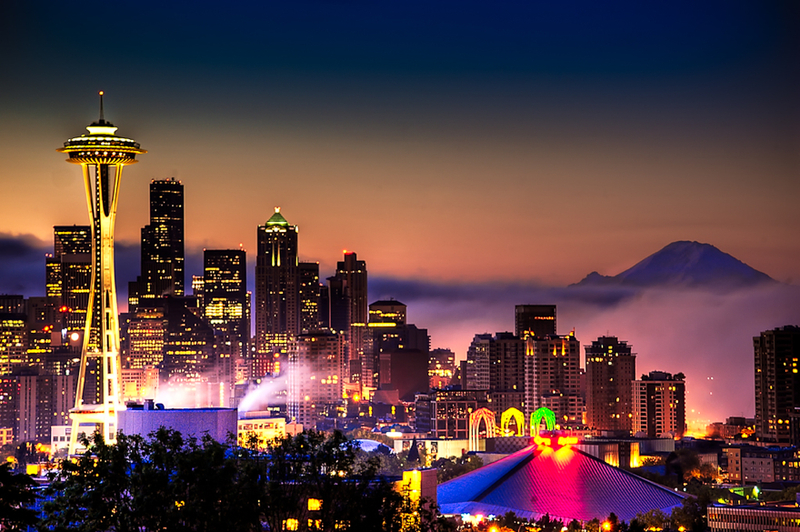 Nowadays, Seattle has become a place filled with things to see, experience cultural events such as the Seattle Philharmonic or the exceptional Ballet co. But first things first: The Space Needle is a must see, the equivalent of the Eiffel Tower in Paris or the Empire State Building in NYC. It’s an iconic building, erected in 1962 for the World’s Fair, and is 605 feet high. After the elevator ride, which takes 43 seconds the elevator operator usually gives the quickest verbal tour of Seattle and it’s surroundings. When you reach the observatory, open views of downtown Seattle, Olympic Mountains, the Puget Sounds, Lake Washington and surrounding cities. The view is spectacular, despite not being the tallest building anymore in Seattle’s skyline, because of a city ordinance that preserves the sight lines from the tower. For the best view of the Space Needle, and in fact the whole of Seattle’s skyline, is actually a few steep blocks away, at Kerry Point, made famous by TV’s ‘Frasier’. Then, off to Pike Place Market, where fresh fish (mainly wild salmon), the freshest of farm produce, crafts and the original Starbuck, founded in 1971, can be found and enjoyed. The vegetables and fruit are so fresh and crisp they feel just picked and oozing nutrients. The Waterfront is an awesome experience, especially with it’s newest addition- the Seattle Great Wheel. It is only two years old but has the drawing power to attract visitors in vast numbers. It’s the largest observation wheel on the West Coast at 175 feet in height 42 fully enclosed gondolas, each holding eight people. Since Seattle is blessed (or cursed, depends on your outlook) with a rainy climate, you can be dry and snug as you ride the Wheel and take in the views on the three revolutions of the ride. It’s great fun for both kids and adults. The Aquarium is also at the waterfront, where the attendants have hands on experience with Marine preservation and education. The art museum is a post modern building with a wonderful collection to savor and the Klondike Gold Rush Museum is a free museum, telling the city’s history beginning with the tragic fire which burnt it down and the Gold rush which rebuilt it. 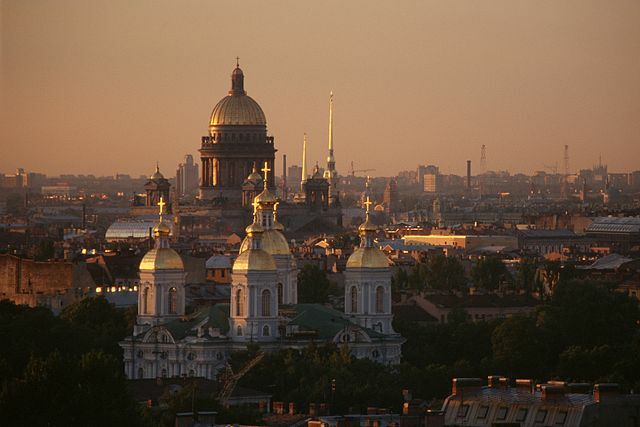 The city is a cornucopia of activities, vibrant and alive with special events and festivals. If you happen to be there on the first Thursday of the month, you could partake of the ‘art walk’ in the historic Pioneer Square, with free admission to galleries and local artisans set up booths in Occidental Square, selling their ceramics, jewelry and art. 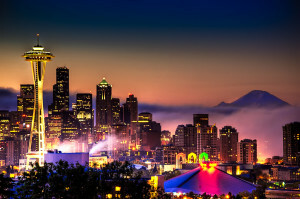 Every month has a specific themed festival and to find out which festival is happening when you happen to be there just go to http://www.tripadvisor.com/Travel-g60878-s408/Seattle:Washington:Events.And.Festivals.html Enjoy! This entry was posted in Cruise Tips, Travel Experiences and tagged Alaskan Cruise, Seattle on June 3, 2014 by slAdmin. Yesterday, at Whole Foods, I started talking to a very nice woman, a visitor from Alaska’s State Capital. She commented on the variety of produce and the difference in prices for certain items, between New York and Juneau. Soon her husband joined us with a cart full of fresh veggies and fruits and they told me, that they are both doctors who were invited from Eastern USA to work in downtown Juneau, fell in love with the place and now are returning to the big apple to visit their parents and siblings. We got to talking about what it felt like to go from here to Alaska, and both said the place has a magic all it’s own, with highly active lifestyle and natural beauty in abundance. 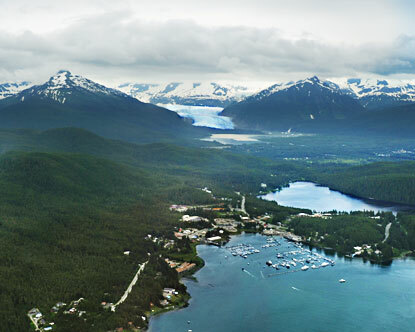 The woman told me that when arrived in Juneau by boat (they were moving cross country, furniture and all), they were told the only way to Juneau is by boat, airplane or birth canal. This expression is an ongoing jocular statement which actually reflects reality. They were in amazing shape, a fact they attributed to the outdoorsy lifestyle they are living. Every free moment is taken up hiking, mountain climbing and eating fresh fish caught by them, on their salmon and halibut fishing expeditions. There are no roads going in or out of Juneau, making it the only state capital inaccessible by cars. All around the town is surrounded by nature, sitting snugly between Mount Juneau mount Roberts and the Gastineau Channel. I thought about the blisteringly hot and humid New York July I left behind and flew to Seattle to begin my first Alaskan cruise. As soon as I stepped off the plane, I was enveloped in fresh clean air, which got cooler and more pristinely refreshing as we headed deeper into the state and it’s capital, named after prospector Joe Juneau in 1880. When we woke up the second morning, there were dozens of mountains, and from the far distance, glistening glaciers, which grew absolutely enormous as our boat edged its way closer to the harbor. My companions and I were booked on an excursion by a float trip on the spectacular glacier studded Mendenhall lake, passed the 2 1/2 mile long Mendenhall glacier, sighted some humpback whales and a number of Kodiak bear almost close enough to touch. The city itself is fascinating, built by the gold rush, with lovely old buildings from that era. There is so much to see, just walking around on foot or taking a helicopter ride to experience the stunning beauty of the town and the surrounding jewels of nature. The Juneau Douglass museum is a cornucopia of exhibits, relating to local history, the Indian heritage with totem poles, and a chronicle of the gold rush prospectors. This entry was posted in Travel Experiences and tagged Alaskan Cruise on May 28, 2014 by slAdmin. Bergen or Bryggen (the local pronunciation) happens to be the only town in Norway that I know well enough to actually say with confidence, it’s far more to me than a tourist resort or a Kosher vacation. I spent a whole month there, staying with my close friend Gina Overland, a young doctor and an incredible person. As a result, I got to meet many Norwegians on a personal level. Since she and her boyfriend are vegans I could eat healthy gorgeous meals without being concerned about Kashrut and participate in the healthiest lifestyle I have experienced anywhere. The city is beautiful, I couldn’t help clicking away on my camera, taking pictures, and have created some of the most beautiful paintings I have ever painted. When I got there by train from Oslo, I was almost in tears from all the natural beauty around, feeling a highly spiritual gratitude to Hashem for his Creation of such magnificent majesty. I had a stop in Geiranger, about which I wrote in my previous blog, and spent half a day kayaking and soaring high in spirit. When I took the train to continue to Byrggen, all I thought about was the excitement of seeing my girlfriend and for a change. I did very little research about the town I was going to spend time in. Nevertheless, the amazing views of the rail line, crossing the mountains, endless villages, and sparkling blue fjords kept me in a state of bliss. Arriving at the lovely train station, there was Gina with a giant bouquet of flowers, and tears of joy. We haven’t seen one another for two years, yet I was too excited to go home and catch up. There would be plenty of time for that… Instead, we took my luggage and the flowers to her house and went straight to the famous UNESCO Bryggen Wharf, which is very close to the train station. We made our way through the colorful wooden wharf houses, perfectly intact from the Hanseatic era. We visited the fish market and the adjoining open-air market. The town is beautifully situated by the famous Bergen fjord, which is surrounded by seven mountains and is considered the gateway to the Norwegian Fjords. It’s amazing how the fjords carve their way from the coast into the countryside, thus infiltrating the town and adjacent mountains with the bluest, cleanest water, creating so much beauty. I was told from time to time that I had not stopped smiling the whole time I was there. For some reason the waterways of Venice, Italy popped into my consciousness, as I’m sitting here writing this account of Bryggen. Venice an exquisite town built on a body of water, and not unlike Bergen, has an endless amount of canals and water wherever you are. Yet there is a huge difference between the two cities: as opposed to the gorgeously decadent palaces atop the water, the quality of the canal waters in Venice, which are greenish blue with a distinct smell of age and and ancient history. The waterways of the fjords in Bergen are fresh, young, invigorating and come naturally without human interference. Whereas as the Venice canals lull one to to a dreamy state of laziness, a ride or even a look at the fjord waters awaken the athlete in us, almost commanding you to exercise and eat healthy foods. It could just be my very own perception, but looking at the slender and fit Norwegians, my theory seems to work. Another must see on a day trip, is the funicular, which can take to mount Floyen. Breathtaking beauty and an adventure even the tiniest kids and the frailest of adults would enjoy. There is a cable car to the top of mount Ulriken, the highest mountain surrounding Bergen with an altitude of 700 meters above sea level. The view from the top takes your breath away, and a scheduled bus service takes you to the city center, and from there to the cable car or car station. My hosts and I took our time before we explored the different and wonderful museums, but if time is limited, it can be done satisfactorily, during a single day shore excursion. Bergen is home and birthplace of composer Edvard Grieg, whose home, a tiny wooden villa with a gorgeous garden by the Nordas lake is a must see for classical music lovers. By the way, Bergen has a symphony orchestra which is so brilliant, that if you find that your boat docks there on a day which offers a matinee, try to make it. The same can be said of the local Ballet Company, which offers world-class performances. Kode the art museum houses work by Edvard Munch, the expressionist painter of ‘The Scream’, Picasso, Klee and 68 others. The aquarium at the Nordness peninsula can be reached in a few minutes by taking the tiniest of ferries, departing from the fish market. On the way back I suggest strolling through the picturesque Nordness, reveling in the beauty of the narrow streets and small, painted wooden houses. Although I found enough to fill a month of staying in Bergen, most of the highlights can be crammed into a delightfully enjoyable one day, if you come by boat to Byrggen. The beauty you’ll encounter will make your heart soar. This entry was posted in Travel Experiences on May 15, 2014 by slAdmin.